Bathroom furnishings can help elevate this room from a public outhouse to a luxurious throne room. With proper furniture, hardware and accessories not only will your bathroom appear more organized, it will also become more hygienic as well. No more toothbrushes on the sink. No more toilet paper pyramids on the tank. With bathroom accents like the toilet butler and the storage module, you’ll be able to focus on more important things, like shaving that handle-bar mustache! 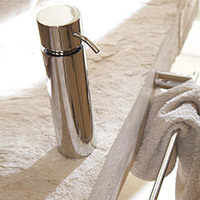 This collection of bathroom furnishings aims to help organize and stylize your space. Storage furniture in the form of shelves and cabinets fit comfortably in the room and help to keep your accessories well-organized. Who says your bathroom cabinets have to be made out of flimsy material? 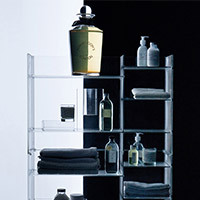 The Sound-Rack Cabinet by Kartell is made from durable PMMA plastic and has several sturdy shelves for storage space. Its flashy color and sleek design will also help you elevate the modern aesthetic of your bathroom design. Modern hardware and accessories, including toilet paper holders, towel racks, hand soap dispensers and waste baskets further add to this notion of staying organized. Plus, you'll love the contemporary nature of the stainless steel furnishings from Blomus. 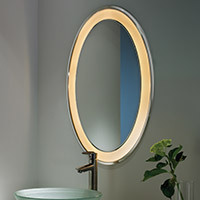 And a vanity mirror on the sink or for on the go will ensure you're looking great at all times. Finally, help make your bathroom comfortable with an assortment of towels and a plush mat on the floor. Look to Missoni or Chilewich for textiles you'll enjoy introducing to the bathroom. With the right mix of bathroom accessories, you're throne room will be elegantly organized and of course, stylish. With so many options for bathroom decor, the opportunities to give your bathroom a personality are nearly endless. To choose the best furnishings for your bathroom, you'll need to consider what exactly it is that you need. If you've got a tower of toilet paper rolls anywhere in the space, there's a solution for that. Likewise, there's a solution to ensure you don't have loose towels thrown around the room. Once you know what you need to solve a necessary problem and give the room a little character, you can begin refining your options by the colors and finishes that best fit in with your existing lighting and bathroom decor. 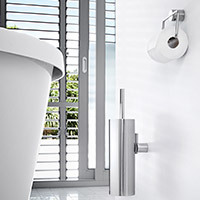 If you have any questions about the bathroom furnishings featured here, please call our decor experts at 877.445.4486. You don’t have to cover your bathroom floors with a beach towel or a pad meant for your cat box! The shag bath mats are a luxurious way to keep you from slipping on those wet, after-shower floors. Not only is the material comfortable, but they also have eye-catching, modern designs that are sure to exude that stylish flair that will put your guest’s mind at ease when they can’t hold it any longer. And while you're decorating the space, why not consider introducing a new bathroom lighting? Bathroom ceiling lights including recessed fixtures for the shower and flushmounts work well will wall-mounted sconces and light bars to created a well-rounded and well-illuminated space.